I love makeup always have, probably always will! However, now that I don’t work; wait I take that back, I DO work! Watching my Granddaughter full-time is a LOT of work! HOWEVER, on the upside she doesn’t care what the NaNa looks like as long as I just show up. So, as a result I’ve gotten lazy with my makeup routine, I’d rather sleep that extra 15 minutes so it’s pretty much a swipe of blush and lip gloss. DONE! The other reason I don’t wear a lot of makeup is the wrinkle factor. Regular powder mineral makeup settle in those lines and accentuates my lines and wrinkles. I also have a problem with shine. I HATE a shiny face. HATE IT!! 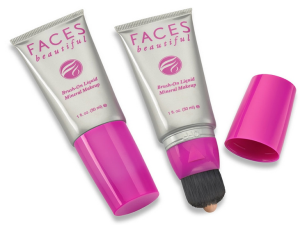 I was thrilled to be given the opportunity to review Faces Beautiful’s liquid mineral makeup. There are several reasons I’m impressed with this makeup. First, no brush needed! 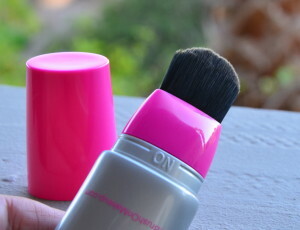 This makeup comes with its own applicator! Seriously EASY!! Just click the cap to ‘open’ squeeze a small amount to the brush and twist closed. 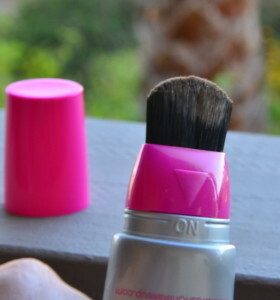 Then using the brush just apply your makeup. The liquid makeup is silky-smooth and yet has excellent coverage to hide my dark spots. You don’t even need to use an added concealer or even a primer! Added bonus this makeup is water-resistant!! Of course my favorite feature (after the all-in-one makeup/brush applicator) is the fact my skin looks healthy NOT greasy! More to love is the fact that the tube is air-tight which is great for travel. This all-in-one tube also means less stuff in my makeup bag which is nice. Check out this video about Brush-On Liquid Mineral Makeup; how beautiful is Gail Sagel, she is not only the CEO of Faces Beautiful but she also created this amazing product!! The formula is actually so unique that your skin looks natural, yet better than naked. FACES Beautiful mineral makeup actually improves the texture of your skin and gives you a more flawless finish. You don’t even need powder to set the finish! There’s never any unnecessary dryness or flakiness on your skin. 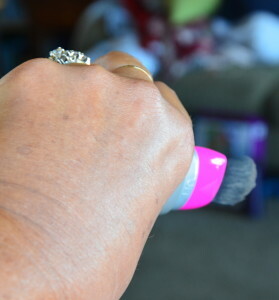 The Brush-On Mineral Makeup dries so light and airy; you’ll never know you have anything on your skin. You will look and feel as if you’ve been professionally airbrushed. Not a single solitary one! This makeup is perfect for a flawless finish that lasts all day long!! 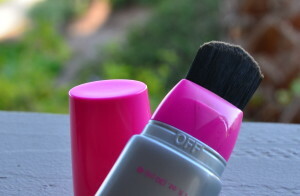 Brush-On Liquid Mineral Makeup is water-resistant but still feels light on my face! Added bonus is the fact that mineral makeup contains natural minerals and botanical components that provide the skin with natural sun protection. It is contains titanium dioxide. Titanium Dioxide provides a natural protectant from the sun’s rays. Mineral makeup can be used to supplement your sun protection; however it should never serve as your first line of defense against sun damage or be a substitute for your sunscreen. At last, a liquid makeup that doesn’t let the air get to it. So much more hygienic and it won’t dry out. 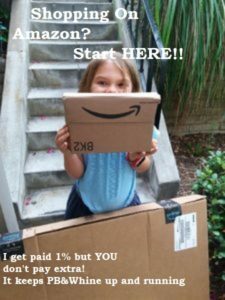 $100 Amazon Gift Card Giveaway!! Mazda5 Grand Touring is great for camping! !